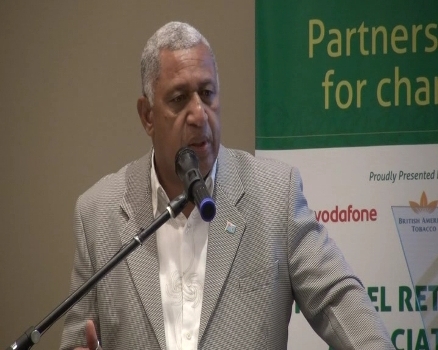 Prime Minister Voreqe Bainimarama has encouraged fuel retailers to adopt environment friendly policies that ensure sustainable development. General Meeting of the Fiji Fuel Retailers Association in Suva this morning. ‘’No matter how much we develop, I believe the Fijian people must always place the sanctity of our environment before any other consideration. Our robust economy has put more people on the roads, encouraged more people to buy vehicles, and caused more goods to be traded and shipped. And FFRA members have been at the centre of that. We hope in the future to rely on newer, cleaner fuels’’. Bainimarama also says he will personally ensure that the interests of fuel retailers are given full consideration at the ministerial level. However, the Prime Minster was quick to point out that he can’t intervene in the price-control deliberations of the Commerce Commission as it’s an independent statutory body. Retailers have expressed their concern at low profit margins due to the pricing mechanism in place.